Nice post! Growing up I was a huge Lego fan and still drag my girlfriend in the store about once a year just to look at the new products. Honestly, I’m shocked the company has lasted this long with such a simple product. I believe their licensing agreements with films and television shows have really helped the company. What was once just a little plastic brick can now create Gotham City or Luke Skywalker. I would agree that most people who want Legos wouldn’t search for broad terms like building blocks. Lego is a stellar brand and I think most people who want the products would go straight the source to buy them. While it didn’t happen in your case, I always like when a retailer ranks above a brand in search. It blatantly shows that the brand isn’t investing enough in SEO. Other brands like Amazon or Target are clearly stealing sales right from the product brand. If the product brand invested a little more in SEO, they could probably get more people to their website where they probably get a higher margin on the products. Thank, Sean! I must admit, I still enjoy building with Legos. There’s something satisfying about being given a plan and building something dynamic and fun out of small pieces of plastic. This searching was a big eye-opener for me, helping me to realize that I don’t search for things using broad keywords. It makes sense that they wouldn’t come up as high in a search as perhaps a more targeted use of a specific product’s name would. I definitely agree with you that other online sellers and undoubtedly taking some online sales away from Lego. I wonder, though, if it’s due to better investment in SEO or just our own level of familiarity as consumers for brands like Amazon, Target, etc. Given the fact that Lego controls 85% of the construction-toy sector in the United States and that its global market has steadily been increasing for the last three years, my initial prediction would’ve been that Lego would’ve been on page 1, or at least on the top of page two, for each of the keywords you listed. One keyword in particular, building blocks, surprised me by being on the 10th page. While Lego isn’t technically selling traditional building blocks, you do use the toy to build and construct things. On the other hand, I was really surprised to see that the keyword bricks came up so high in Google. I associate bricks with building universities and homes. The fact that Lego bricks are able to build toy versions of these places doesn’t even cross my mind. I’d like to add that I think you did well in excluding sites like Amazon and Toys”R”Us from your findings. Including them would’ve been a misrepresentation of how well Lego is doing with regard to its SEO. Overall, I really enjoyed reading your post. I think the fact that you are a mother makes it even better because you’re around the target audience of Lego every day, so you have a good feel for what makes your son, and others like him, enjoy playing with them, and what parents are likely to search for when looking to buy a Lego set for their children. That being said, I think you’re absolutely right. 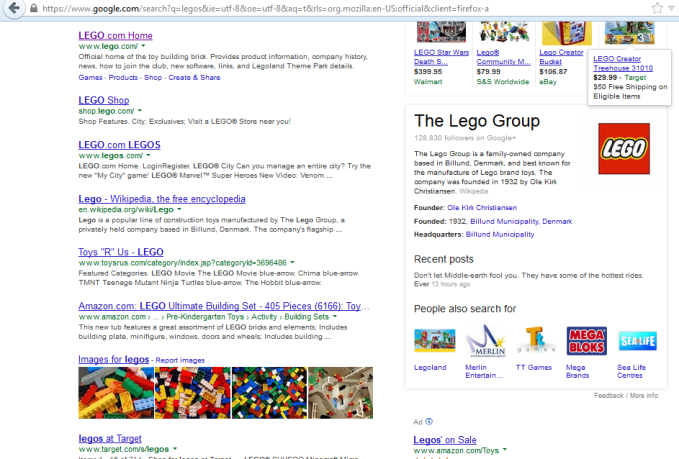 Lego is a big enough brand that most people are likely to just type in lego.com in the address bar rather than search for it using long-tail keywords. Thanks Lynette! I appreciate the feedback! Since I am Lego’s target consumer I’ll let you in on a little secret: Legos are actually referred to as “bricks” because of their interlocking capability. We visited LegoLand here is Florida last Summer, and we were most impressed with their MiniLand, where they had built everything from a model of Kennedy Space Center — including the Space Shuttle — to a one of the Las Vegas Strip! It was awesome. That sounds so cool! I’ve always driven past it but never checked it out. That’ll have to change at some point! Yes, I’d recommend it! It’s not really for everyone, but if you love Legos or have a kid who loves Legos with you, it’s a great alternative to the larger theme parks in the Orlando area. The water park isn’t as good as SeaWorld’s Aquatica, but it’s still a lot of fun. As a whole, Legoland is also much more kid friendly in it’s ride offerings. There’s nothing that might be too scary. I enjoyed learning more about Lego through your post. 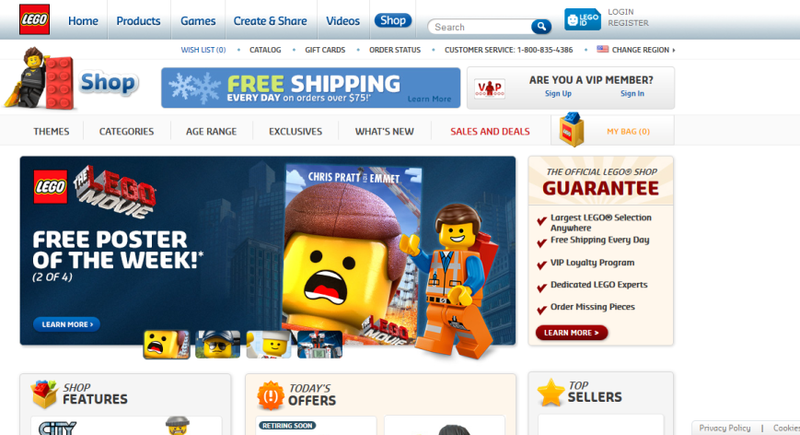 I agree that a vast majority of Lego customers are purchasing items through sites such as Amazon. My baby sister is currently in that elastic bracelet loom phase, and when purchasing her Rainbow Loom, I went straight to Amazon skipping the official Rainbow Loom website. Why? Because Amazon is not only more cost efficient, they also provide great customer service. Plus, it’s not an additional website that I have to register for. They know me, and they have my information. Hi, and thanks for your comments! Most of the kids I know are into the Rainbow Loom, so she’s definitely not alone! Like you, I go directly to Amazon when I’m looking to buy online. Sometimes I go directly to brand websites, but then end up searching at Amazon for the same items because they’re, inevitably, cheaper through Amazon. With SEO being influenced through users, I think had I used specific product names I’d was looking for, I’d have had better results. The problem with that is Lego sells tons of different products, some of which fall under specific licensed lines. When searching directly on the online store, a search for “Star Wars” brings up 119 shop results and 283 results under the heading “Products, Games and More.” That’s a whole lot of Legos! Thanks Aldona! I actually thought of using the word “toy,” but then found in some of my research that the company didn’t view Legos as toys, but a “system of play,” so I specifically excluded it. I would think that the fact that Lego offers so many products makes it difficult in determining just what keywords to use. I work with children and frequently order Legos online, but I don’t think I have ever been to Lego’s website I simply go straight to Amazon. It is interesting to see how Lego as gone from just building block toys to video games and even know movies, but it illustrates the brand’s desire to change and grow. Absolutely, Emily! If I were to research another global company’s SEO search results, I would definitely use more targeted keywords. Interestingly, living so near Lego stores and Legoland here in Florida, I think the Lego store is a great place to purchase Legos if they’re being sold at a comparable price. They have all sorts of perks like Club Lego where you sign up for a free magazine sent to your home, exclusive products, and even a VIP program where you can earn rewards as you shop. You should check it out!